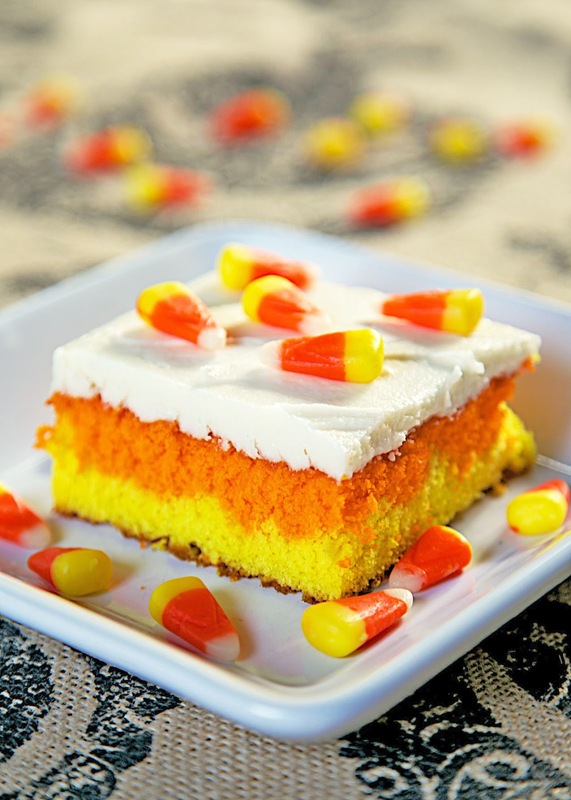 Looking for a fun and easy Halloween dessert? Look no further! 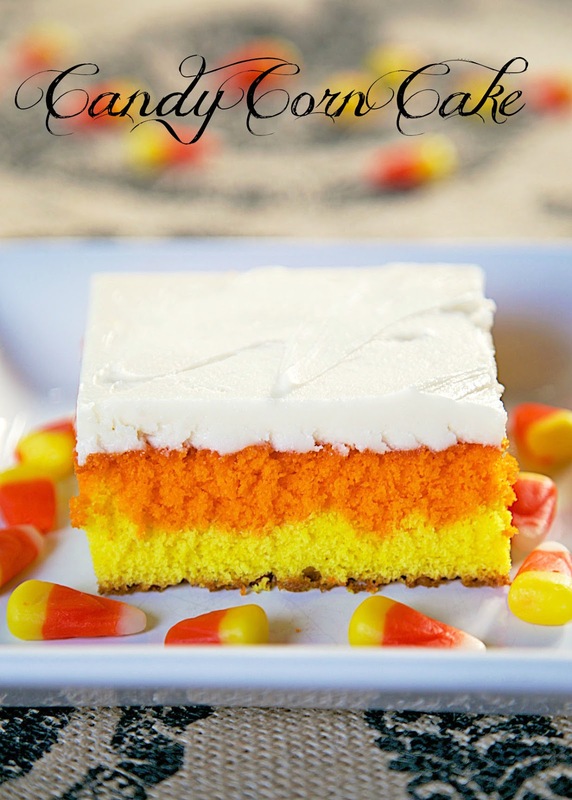 This Candy Corn Cake is not only festive, it is super easy. I used cake mix for the cake, but I made the frosting. If you don't want to make frosting (you totally should), you could just use a can of white frosting. It couldn't be any easier! Want to know the secret to getting nice layers in a sheet cake? You have to freeze the layers so they don't run together. It takes a little bit more time, but it is totally worth it. I froze the yellow layer for about 30 minutes and then spread the orange batter on top of it. Once both layers are in the pan you have to let the batter thaw before you bake it. If you don't thaw the batter, the yellow layer won't rise. I just sat the cake pan on top of my range and let the heat from the oven help thaw the batter. Once the cake has thawed, just pop it in the oven and bake as usual. Prepare cake mix according to package directions. Divide batter in half. Color one half of batter orange and the other half yellow. Grease and flour a 9x13-inch pan. Pour yellow cake batter into the bottom of the pan. Spread evenly and place cake pan in the freezer for 25-30 minutes. Make sure the pan lays on a flat surface. Bake cake for according to package directions, approximately 30 minutes. Remove from oven and allow to cool completely. To make frosting, in the bowl of an electric mixer fitted with the paddle attachment, cream butter until smooth and creamy, 2 to 3 minutes. With mixer on low speed, add 3 cups sugar, whole milk, and vanilla; mix until light and fluffy. If necessary, gradually add more powdered sugar to reach desired consistency. Spread frosting on top of cooled cake and cut into slices. I am definitely making this! Great tip too! So cute!! Will try this for a Halloween party coming up.